MicroStation plays important role in geoinformation systems (GIS) especially in Automated Mapping/Facility Management (AM/FM). In these areas, raster data such as satellite images, air photos, scanned topographical maps or other types of imagery are becoming increasingly popular. It has been estimated that these data may represents more than 90% of the average GIS data holding by volume. 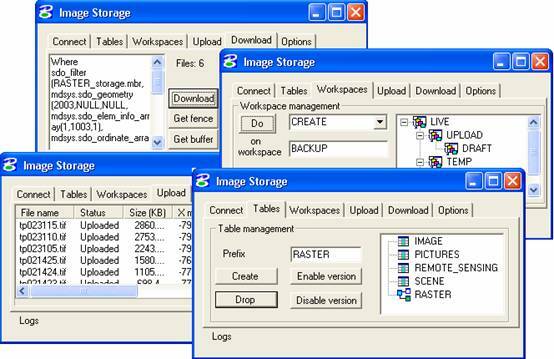 MicroStation V8 comes with Raster Manager as a solution for united raster management of different raster formats. Oracle 9i brings its GIS technologies like Spatial option, interMedia or Database Workspace Manager for effective database storing of geographical-related data. Oracle database is used in number of organizations to manage all kinds of data across the enterprise. In this article, we will join Oracle GIS technologies with MicroStation v8 to build up a prototype called “Image Storage” for storing rasters in Oracle9i database using Oracle interMedia, Oracle Spatial, Oracle Workspace Manager and finally displaying query results with help of Raster Manager and it’s clipping capabilities. We are going to point out some interesting concepts and techniques in Image Storage. Nowadays there are only a few solutions for storing rasters in databases, actually most of the interest in raster management lies in using compressed proprietary formats like Mr.SID or ECW. Note ECW is supported in MicroStation v8 as well. Following picture represents the architecture of the application prototype. Data tier utilizes Oracle 9i technologies for image store, spatial location and long transaction. Logical tier of Image Storage benefits from Java 2 environment available in MicroStation v8 and additional java classes provided by Oracle 9i for object manipulation. MicroStation v8 supports native code with full access to MicroStation Development Library, hence the presentation tier was designed in Visual C++ using MFC. Communication between native and Java code is provided by Java Native Interface (JNI). The architecture was designed to handle different tasks as simple as possible. Conventional database management systems are designed to handle relation model and short-transactions. These technologies are insufficient for GIS applications where we work with spatial objects, images and transactions can take days to complete. These types of problems require different technology. RDBMS needs an extension for long-transactions, the storage and management of image data together with other information. The environment should facilitate manipulation and query with spatial features. This problem was recognized before couple of years and software companies started an extension their products by new features. The examples of the extensions are workspace manger, spatial and interMedia options in Oracle 9i. This object-relational database management system and embedded functions can sharply help you to design GIS applications. Spatial index mechanism. It is a key feature, the choice of type of spatial index has an influence on a performance and every developer would recognize those mechanisms. Today, you can use Oracle spatial advisor to reduce an expense and time to solve this problem. The column MBR in table img_storage represents minimal boundary rectangle of the raster stored in spatial object and will serve for locating purpose. Suppose we have populated data into database. Example of spatial query used for locating rasters in download follows. Note the coordinates are taken from fence placed in MicroStation and passed into Java code for processing. interMedia enables Oracle 9i to mange and retrieve images and others heterogeneous data. The technology is based on object relational database system, which provides support for definition of object types and methods that work on them. The objects of Oracle interMedia are stored in binary large objects (BLOB) in Oracle9i or in file-based large objects (BFILE) in file system of operation system. Applications can interact with database objects through modern Java library or traditional PL/SQL and Oracle call interface. Images are stored in ORDImage object that supports two-dimensional, static, digitalized raster images in binary representation. The object can store and retrieve image data in any format and supports among others methods for inserting a row using BLOB images, populating a row using BLOB images, copying an image, converting an image format, extending interMedia with new image types and many others. An example of using interMedia image object will be an upload of image into Oracle and download image from database to file system. An upload consists of select query on row where the image is going to be uploaded via OrdImage object. Concurrent access to the database. In the database without versioning, users can change same record only when other user has not locked it yet. The versioning ability relaxes this rule and improves concurrent access to the database. What-if analyses can be run simultaneously. Each analysis works on a separate version of the data. After the completing of analyses, the results can be stored in the database for lookup. A database table is base element for versioning, which means that all rows in the version-enabled table can now support multiple versions of data. The infrastructure is not visible to the users of the database. The system offers set of functions for manipulating with results. Since workspace manager creates tree of spaces, all functions are fitted for it. For example the MERGE propagates all changes from child workspace to the parent workspace. The REFRESH has opposite effect.